With the opening of the Prince of Wales Dock by King Edward VII in October 1881 and the greatly increased facilities for coal shipping, it was thought the mineral wealth of the Rhondda Valley could be diverted to Swansea 40 miles nearer the open sea than its sister port of Cardiff. 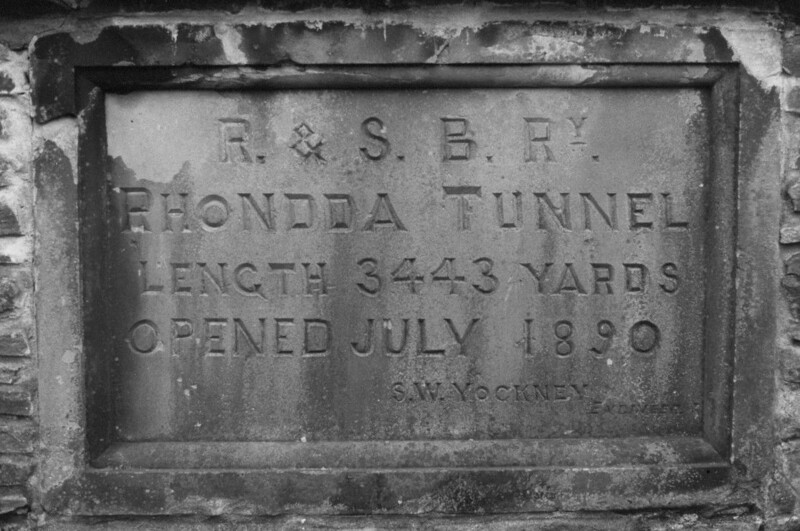 Opened throughout in 1895, the R&SBR boasted the single bore Rhondda Tunnel at 3443 yards (the longest tunnel in Wales) opened on 2nd July 1890 and Neath River Bridge (the only swing bridge on a skew and curve in Britain) both engineered by S.W. Yockney. The line started at Treherbert station with 20 chains of running over the Taff Vale Railway , the first station being Blaenrhondda whence there was a stiff climb to the mouth of the tunnel, the summit being reached as the train emerged from the other end at Blaengwynfi. At Cymmer a junction was formed with the Llynfi and Ogmore section of the GWR. Cymmer was one of the largest stations on the line and served Glyncorrwg. A steel viaduct carrying the GW across the Afan River was to the right. Passing Duffryn Rhondda, Cynonville, Pontrhydyfen and Cwmavon (Glam), Aberavon Town was reached at the end of the main thoroughfare of Port Talbot and crossed it on the level (a major source of road traffic congestion) before heading for Aberavon Seaside and Briton Ferry. At Aberavon Town a connection was made with the Port Talbot Railway Company's lines into the docks and at Briton Ferry junctions were made with the GWR dock lines. At Court Sart there was another junction with the GWR and the R&SBR branch to Neath (Canalside). Between Court Sart and Jersey Marine was situated the Cape Copper Works and after the latter, the R&SBR ran parallel with the GWR (Vale Of Neath) lines to Swansea East Dock. After passing Danygraig (location of the main R&SBR works) a connection with the Swansea Harbour Trust lines gave access to the Prince of Wales dock. A few chains beyond the junction was the terminus of the R&SBR at Swansea Riverside, 24.5 miles from Treherbert. The gradient (the steepest being 1:39) mainly with the load but from Treherbert to the tunnel mouth was at 1:55 with loaded mineral trains having to be banked out of the Rhondda Valley. The GWR obtained running powers from Court Sart Junction to Dynevor North Junction ultimately giving access to and forming part of the Swansea District Line opened in 1912. In January 1906 the GWR contrived to take over the management of the R&SBR together with the PTR in order to thwart the Barry Railway's plans to extend their Vale of Glamorgan line to Port Talbot, Neath and the Swansea Valley. Rationalisation in the Swansea Bay area in 1933 diverted the R&SBR passenger services onto the GWR lines with the closure of the R&SBR stations between Jersey Marine and Swansea Riverside. In September 1935 all passenger traffic was further diverted onto the GWR main Line to Neath General and Swansea High Street. Of the eight or so daily passenger services (there were also a number of short workings), several ran through to Cardiff and Penarth via Pontypridd with coaching stock being supplied alternately by the TVR and R&SBR. These workings continued long after nationalisation. Locomotives were supplied by Treherbert, Duffryn Yard and Danygraig sheds with 56xx's and 57xx's the mainstay although Taff Vale O4's and A's were also regulars with two of the latter shedded at Danygraig. The passenger service ceased on 3rd December 1962 and goods traffic (Duffryn Rhondda to Briton ferry) on 2nd November 1964. Taff Vale 'A' No 365 ran off the viaduct at Cymmer in 1946 whilst hauling a workmen's service but fortunately there were no fatalities. A more serious accident occurred in December 1960 when a three car DMU was involved in a head-on collision with 0-6-0PT 9737 hauling a down coal train near Pontrhydyfen. Cymmer station buffet and platforms together with those at Cynonville, along with Danygraig Shed and Neath River Swing Bridge remain but both mouths of the Blaenrhondda Tunnel have been completely landscaped and thus totally obscured. However, the headstone of the latter is on display at Afan Argoed Country Park. For the Rhondda & Swansea Bay Railway. Bygone Railways of the Afan. - 1982 Clive Smith - Alun Books.